Every time you go camping, the idea is to break away from the routine of everyday living and relax and enjoy nature. It is for this reason that most people opt for minimalistic packing for such. While this is a good thing, we often forget to consider our comfort when sleeping during camping trips. Having a comfortable sleeping bag or sleeping mat is not enough. You need a quality camping pillow to complete ensure a good night rest while on your trip. If we are being honest, stuffing clothes beneath the neck is rather uncomfortable and fails to provide the necessary support to your head, neck, and shoulders. How then do you pick the best camping pillow? 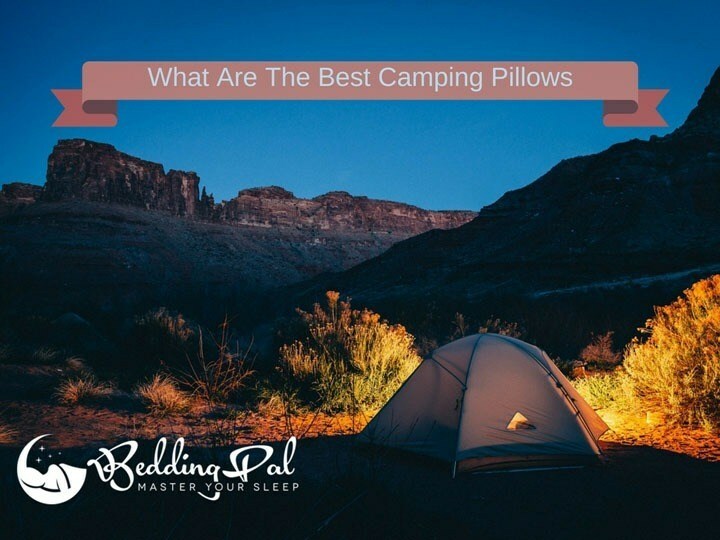 This simple guide will walk you through the different features of a camping pillow that you need to look out for, the benefits of having one in the first place as well as a comparison of some of the best sellers on the market today. Camping pillows help bring the comfort of your home to you. Camping pillows provide you with the necessary comfort to ensure that you fall asleep faster and sleep comfortably throughout the night. This keeps you from needing to constantly wake up in the middle of the night to adjust your sleeping position allowing you to sleep soundly; just like you would do at home. They are light in weight. Another major concern for campers, especially backpackers, is the weight of their luggage. If a camping trip involves any form of trekking or hiking, then you will want to keep your luggage as light as possible. That said, the light weight of camping pillows allows campers to include them in their luggage without compromising the need for a light load. They can be used as travel pillows. These pillows come in handy as travel pillows due to their small size. Instead of carrying a regular home pillow with you, a task that is rather cumbersome, a comfortable camping pillow will work just as well. They help to improve your sleep. Rolling up clothes or using your duffel bag as a pillow during your camping trip is rather uncomfortable and may lead to stiff neck or sore shoulders. Camping pillows not only help to keep your spinal alignment as you sleep but they are also comfortable to sleep on. The anti-slip feature keeps them from moving around as you sleep thus ensuring that you have sound sleep. Before we dive into the benefits of having a camping pillow, let’s take a minute or two to understand the concept behind them. These pillows come in a variety of shapes, forms, and sizes and are generally grouped into inflatable, compressible, and hybrids. Inflatable Camping Pillows: Like the name suggests, inflatable pillows are those that require being filled with air in order to be functional. These come in handy when looking to pack as little as possible as they do not take up much space. They also offer their users the freedom to adjust the firmness to a level that is comfortable. Compressible Camping Pillows: These are soft and light and get their name from their ability to be compressed under the weight of your head and shoulders. They are made from a variety of materials including foams, synthetic fibers as well as down feathers. Compared to their inflatable counterparts, these pillows are heavier and take up more storage room. They are, however, soft and comfortable and do not require any form of prepping before use. Hybrid Camping Pillows: These merge the best aspects of the latter into one pillow. They are designed in such a way that the upper part can be compressed while the lower part can be inflated to the desired firmness. They are, therefore, the right fit for campers looking for a pillow with which they have control of its firmness but still provides a soft comfortable place to lay your head. They are heavier than their inflatable counterparts but lighter than the compressible pillows and take up less space than the latter. Comfort: Your comfort is of importance at all times. To ensure that you choose the right pillow based on comfort, think of the pillow you would normally use at home. How firm is it? What materials is it made of? How do you sleep? Answering these question will ensure that the pillow you finally settle on is one that closely resembles that one you use at home to achieve that much needed good night’s rest. Compressible pillows have found to be rather comfortable followed by hybrid pillows and lastly inflatable pillows. Your Preferred Sleeping Position: Even when camping we tend to fall into the same sleeping patterns as we do when at home. Considering your usual sleeping position is, therefore, key to purchasing a camping pillow. If you are a side sleeper, then an inflatable pillow or a hybrid one might do the trick for you since you can get them to be as firm as you need them to yet still remain easy to carry. Stomach and back sleepers can pick from any of the pillow types since all three pillow types have can be thin enough to accommodate these sleeping postures. The Material Used: Choice of a pillow’s material will not only determine its comfort but its durability as well. Materials used to manufacture camping pillows range from nylon to cotton. Since the idea behind purchasing a camping pillow is to ensure comfort and since you are spending money to acquire one, then it only makes sense if you get one that will serve you for a considerable amount of time. Cotton and polyester pillows are, therefore, best suited to ensure both comfort and longevity. Shape And Size Of The Pillow: While often overlooked, the shape and size of your pillow is a key determinant of your comfort. The size of the pillow will dictate the space it occupies in your backpack (if not inflatable that is). It will also determine the amount of wiggle room available in your tent when camping as well as the available area for supporting your head and neck as you sleep. The shape of the pillow also determines how comfortable the pillow is as well as the space occupied. Opting for traditional pillow shapes is, therefore, your safest bet to a comfortable pillow. User-Friendly: Ideally, you want a pillow that is easy to use yet comfortable. Here, compressible pillows are the most preferred since they require no prior preparation. Both inflatable and hybrid pillows will require you to do a bit of preparation before you can use them. They, however, take up little time to get them in usable condition. Price: While evidently not the only consideration to be made before purchasing a camping pillow, you will need to keep in mind the cost of it. Pay attention to your financial capabilities and ensure that you buy the best quality camping pillow that is within your financial range. Quality: While the material used to manufacture the pillow is an indicator of its quality, another quality assurance check you should look out for is the pillow’s warranty. The length of the warranty should give you a rough estimate of the pillows expected shelf life before you are faced with the need to buy a new pillow. Purchasing a camping pillow is bound to be a challenging affair. A quick internet search for the best camping pillow will provide you with numerous options to choose from; each claiming to be the best one in the market. To help you sift through some of the available options, here is a review of six of the best selling pillows for campers with their pros and cons. Everyone wants to sleep comfortably regardless of the type of camping trip undertaken. The Therm-a-Rest Compressible Travel Pillow has earned its place in this guide due to its versatility of use. This pillow has been designed to provide comfort and support whether you are a car camper, a backpacker, or traveling by air or road. Another reason for its inclusion in this guide is the fact that it is environmentally friendly. This pillow uses upcycled waste products that result from the manufacturing of Thermarest mattresses as filling. To make it easy to compress this pillow makes use of shredded urethane foam. It is also light in weight and takes up little space when in its compressed form making it ideal for a camping trip. It is capable of a loft of four inches when unfolded giving it the ability to adequately support your head, neck, and shoulders as you sleep. The cover is made from brushed polyester that adds to its comfort. Comfort is a key consideration whenever one is shopping for a camping pillow. It comes in small, medium, large and extra large sizes, therefore, catering for the needs of different types of people. This pillow is easy to maintain as it is washable and can withstand being machine washed. Users, therefore, do not need to worry about the accumulation of dirt and grime on their pillows with continued use. The ability for a pillow to provide adequate support for your head and neck is an important trait of a pillow that buyers look out for. It is the Trekology Ultra-light Inflating Pillow’s ability to do just that makes it a necessary addition to this guide. The ergonomic design of this pillow is meant to ensure that your head and neck receive the much-needed support while you sleep. As a result, campers are able to enjoy a restful night and wake up free from aches and pains in the neck, shoulders or back. Since it is inflatable, users have the flexibility of increasing or decreasing the air inside the pillow to arrive at a comfortable pressure that is suitable for different individual needs. Despite the necessary prep work that needs to be done before the pillow is ready to use, it is easy to set up as it requires 3 to 5 breaths to fill it up to a comfortable firmness. When you are ready to move on with your journey, this pillow is equally easy to deflate and pack up. The TPU fabric used to manufacture this pillow gives it its elastic and durable properties. The pillow can also be used as a backrest when sitting or as a traveling pillow. Its slip-resistant properties allow it to stay in place even as you move about in your sleep. It also comes in a variety of colors thus catering to different peoples color preferences. A comfortable night after a long hike or drive is just what a camper needs. The Teton Sports Camp Pillow earned a place in this guide due to its comfortable nature. The pillow is light in weight making it the ideal camping companion especially for backpackers (Also Check: Best Backpacking Pillow). Its exterior is made from brushed flannel while its interior is filled with a superloft elite fill that allows for easy compression and improves your comfort when you sleep. The pillow also comes with a cotton case that is easy to wash. Keeping our pillow clean is, therefore, not a hustle. Thanks to its compact size, you can comfortably carry it around with you in your backpack. To add to its stylish appeal, the pillow comes in different colors that can be color coordinated with the lining of sleeping bags from Teton Sports. What’s more, this pillow comes with a limited lifetime warranty that inspires confidence in its quality and durability. Some users found it to lack durability with the filling becoming uneven over time and the center flattening out after continued use. 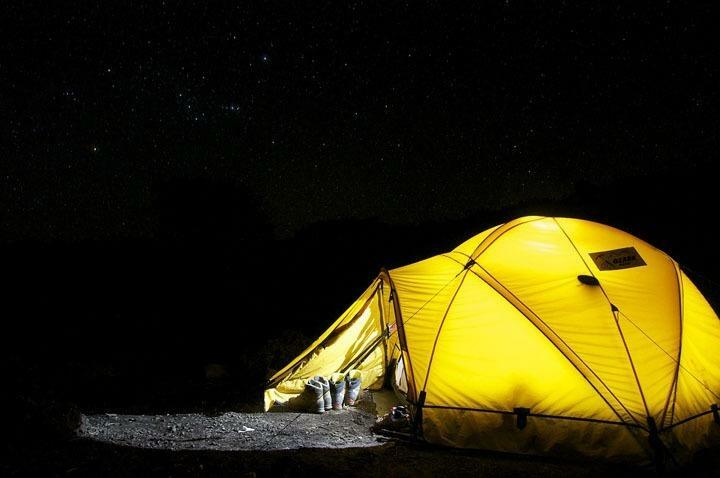 Whenever you are thinking of purchasing outdoor equipment, a versatile piece of camping equipment that can take on multiple roles is one that is preferred. For this reason, the Onwego Inflatable Air Pillow earned a slot in this guide. It is designed to provide comfort whether it is being used as a camping pillow or a travel pillow. It incorporated a contoured designed to maximize the support offered to your head and neck as you sleep. It has a plush foam interior that together with the ability to adjust its firmness gives the pillow its supportive capabilities. This combination makes it suitable for different types of sleepers and leaves its users with a pain-free neck, shoulders, and, or back the next morning. Its lightweight and compact design make it a perfect camping companion. Not only does it take up a small amount of space when packing, it is easy to carry around as well. Its design incorporates a slip-resistant surface that helps to keep the pillow in place even as you sleep. To ensure that users get the most out of their pillows, it is made to be moisture resistant. This quality also helps to improve your comfort as you sleep. Maintaining this pillow is rather easy. All you need to do is wipe the surface down with a damp cloth and allow it to dry before you keep on using it. This quality makes it rather easy to maintain. To cater to the style and color preferences of different users, the pillow comes in a variety of colors. The Teton Sports Comfortlite Self Inflating Pillow is designed around the principle of user-friendliness. Its functionality is much similar to other inflatable pillows; the only difference being that it doesn’t require you to fill it up with air every time you need to use it. All you need to do is to open the inflation valve and you are good to go. To ensure that you have a comfortable rest, the pillow makes use of microfiber on the topside where the pillow comes into contact with your face and a non-slip material on the bottom. The former is to keep the pillow soft while the function of the latter is to hold the pillow in place as you sleep. This pillow is light in weight and is designed to be durable. It lives up to the Teton standard of quality outdoor gear. What’s more, it comes with a limited lifetime warranty. This bold backing of the product by Teton goes a long way in inspiring confidence in the product’s quality and durability. When you are traveling or packing for a camping trip, you want to ensure that your luggage is light yet contains all the necessary things. This camping pillow meets this camping criterion thanks to its light weight and compressible features. This handcrafted pillow is designed such that it is easy to compress and fit it into its stuff bag. It is also designed to fit comfortably into a sleeping bag making it an ideal camping companion. The cover helps to improve your sleep thanks to the manufacturer’s choice in fabrics. It is made from a blend of a poly blend and viscose rayon that is derived from bamboo. The properties of its cover also help to make this pillow hypoallergenic and resistant to dust mites. It is an environmental friendly pillow as it makes use of foam that is CertiPUR-US certified. This means that it is devoid of any substances that pose a threat to the ozone layer. It is also a versatile pillow that can come in handy as a traveling pillow. Users have the flexibility to determine this pillow’s loft by adding or reducing the foam filling until they attain a suitable loft. This feature makes it compatible with a variety of sleeping positions. Lastly, it is easy to maintain thanks to its ability to withstand machine washing. The need for the best camping pillow whenever one goes exploring the great outdoors is often overlooked. The trend of using a duffel bag stuffed with clothes or rolling a jacket underneath your head as a substitute pillow is slowly dying out. More and more people are realizing that while camping is not meant to be a luxury affair, some level of comfort is still expected. Sifting through the differently available camping pillows before finally settling on the right one may be a taxing affair. Despite the numerous considerations to keep in mind, one that should not be compromised is your overall comfort. Remember to keep in the quality of the pillow in mind even as you keep an eye on your budget. We hope this guide goes a long way in making the work much easier for you. Happy camping folks!